Modern comfort meets old-fashioned hospitality at The Great George. 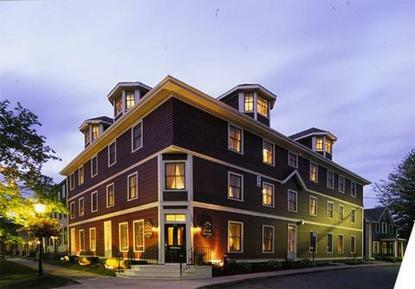 Step back in time at this 4 û star historic boutique property located in the heart of Charlottetown?? ?s National Historic District. The Great George features 12 fully restored heritage buildings, each with its own individual character, size and story. Each of our 53 guestrooms is individually appointed, making each stay a unique experience. The Great George invites you to enjoy that small luxury hotel feel in a setting that embraces the historic charm, elegance and innkeeping spirit of yesteryear. The Great George boasts one of Charlottetown?? ?s best locations. Just one block from Province House and across the street from St. Dunstan?? ?s Basilica, we are surrounded by sites of National Historical importance. We are within a block of the magic of the theatre, steps away from the Charlottetown Waterfont, and you can hear the jazz floating on the air from Victoria Row in the summer months. The Great George is Charlottetown?? ?s Premier Historic Boutique Property, rich with character, personality and charm. We look forward to your visit to The Great George.